Calling all Hipsters, I have the perfect motorcycle for you. The Triumph Thruxton SE. 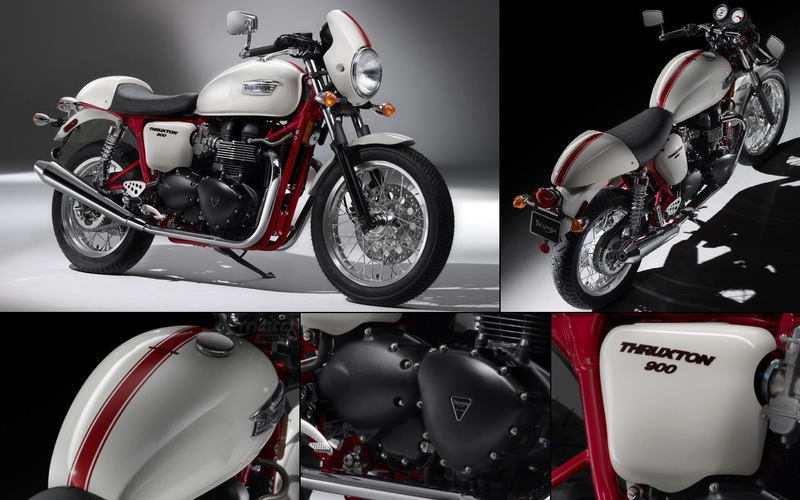 This motorcycle perfectly encapsulates the iconic Café racers with a crystal white paint scheme enhanced by the attractive red line which extends from the small fly screen, over the tank and over the rear mudguard. The classic looks are achieved thanks to a sporty seating position, low rise handlebars, 18 inch spoked wheels and an exhaust to match. The SE I was fortunate enough to ride had a fantastic Arrow aftermarket pipe which enhanced that classic parallel twin engine note. The 865cc parallel twin in question produces a healthy 69bhp and 70nm of torque. The engine is air cooled and features an oil cooler, however everything else is very much up to date. Instead of carburettors there is fuel injection which meets Euro 3 requirements. The powerplant is also tuned to give excellent everyday reliability and produces an inspiring grumble on idle thanks to the cam profile. The frame also features adjustable 41mm forks and a 320mm front disc up front. Triumph have gone through a lot of effort to disguise the modern features under a retro-design. For example the throttle bodies are machined to look like carburettors. This combined with the red powdercoated frame, beautifully machined mirrors and handlebars make the Thruxton a perfect retro bike with all the comforts of modern day technology you would want. This means that weekends are no longer spent under an oily machine with spanner in hand trying to tinker with carburettor related issues, much to the disappointment of traditional bikers. The Thruxton is an enjoyable bike to ride and provides many smiles. It isn’t an HP4 so don’t expect to break any speed records, but it probably turns just as many heads. I wouldn’t imagine many customers buying the Thruxton as their first bike or as their commuter but rather a summer machine that can be brought out on Sunday afternoon for a country ride down to a fine restaurant. The Thruxton is modern day motorcycle style defined.